"We have developed a new method for essentially recovering energy from waste heat. Car engines produce a lot of heat and that heat is just waste, right? So imagine if you could convert that engine heat into electrical power for a hybrid car. This is the first step in that direction, but much more work needs to be done," said Paul Davids, a physicist and the principal investigator for the study. "In the short term we're looking to make a compact infrared power supply, perhaps to replace radioisotope thermoelectric generators." Called RTGs, the generators are used for such tasks as powering sensors for space missions that don't get enough direct sunlight to power solar panels. Davids' device is made of common and abundant materials, such as aluminum, silicon and silicon dioxide—or glass—combined in very uncommon ways. The team calls its device an infrared rectenna, a portmanteau of rectifying antenna. It is a solid-state device with no moving parts to jam, bend or break, and doesn't have to directly touch the heat source, which can cause thermal stress. Because the team makes the infrared rectenna with the same processes used by the integrated circuit industry, it's readily scalable, said Joshua Shank, electrical engineer and the paper's first author, who tested the devices and modeled the underlying physics while he was a Sandia postdoctoral fellow. He added, "We've deliberately focused on common materials and processes that are scalable. In theory, any commercial integrated circuit fabrication facility could make these rectennas." That isn't to say creating the current device was easy. Rob Jarecki, the fabrication engineer who led process development, said, "There's immense complexity under the hood and the devices require all kinds of processing tricks to build them." One of the biggest fabrication challenges was inserting small amounts of other elements into the silicon, or doping it, so that it would reflect infrared light like a metal, said Jarecki. "Typically you don't dope silicon to death, you don't try to turn it into a metal, because you have metals for that. In this case we needed it doped as much as possible without wrecking the material." The devices were made at Sandia's Microsystems Engineering, Science and Applications Complex. The team has been issued a patent for the infrared rectenna and have filed several additional patents. These ideas include making the rectenna's top pattern 2-D x's instead of 1D stripes, in order to absorb infrared light over all polarizations; redesigning the rectifying layer to be a full-wave rectifier instead of the current half-wave rectifier; and making the infrared rectenna on a thinner silicon wafer to minimize power loss due to resistance. Shank said, "We need to continue to improve in order to be comparable to RTGs, but the rectennas will be useful for any application where you need something to work reliably for a long time and where you can't go in and just change the battery. However, we're not going to be an alternative for solar panels as a source of grid-scale power, at least not in the near term." 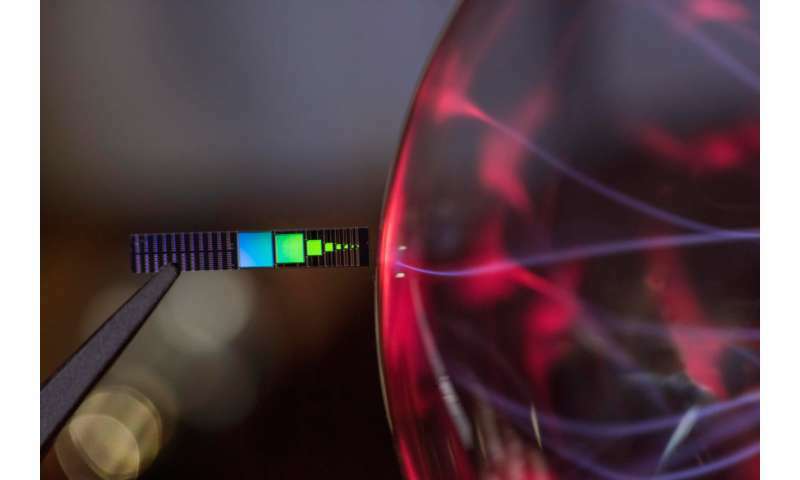 Davids added, "We've been whittling away at the problem and now we're beginning to get to the point where we're seeing relatively large gains in power conversion, and I think that there's a path forward as an alternative to thermoelectrics. It feels good to get to this point. It would be great if we could scale it up and change the world." How long will it be until China steals this technology in spite of its many patents? Somebody else designed something that did the same thing a few years ago. I saw one article on it here on this site and have never been able to find anything else about it since.